On May 8th 2018, EAR-AER organised the conference “Benefits of Territorial Cooperation” in collaboration with Titu Maiorescu University, Bucharest and with the support of the Government of Flanders. The conference took place at the Aula Magna of the Titu Maiorescu University, in the presence of a public of 200 attendees, several prominent figures from the Romanian political scenery; who have been able to listen to 14 different speakers, treating a vast pallet of subjects. Thanks to the prominent presence of the press, EAR-AER president Nelu Neacşu gave interviews for Romanian television. The conference was opened by prof.dr. Iosif URS, president of the Titu Maiorescu University. In his opening speech he mentioned the interest the university shows in contributing to the welfare of society by choosing for applied research in all domains of the academic world. He insisted on thanking the Government of Flanders for the support it gives since 3 years to the EAR-AER enabling this organisation to come on location and detect together with the academic world, the potential contributions to a decentralisation of governance and to regional development. EAR-AER president Nelu Neacşu insisted in his opening speech in the presence of 9 speakers from 7 different countries on the European continent thanks to the efforts of EAR-AER and in the fact that several of the speakers were from universities, enabling a closer collaboration between the host universities and universities in Europe. In his speech, deputy-chairman of the Romanian Chamber of Deputies, Mr. Ben-Oni Ardelean called on not to neglect the rural areas -that often miss electricity and running water- in the development of regions and not to concentrate only on smart cities. He also applauded the words of the president of the university and called for a closer contribution of the university to the development of the country through applied research. Economic development for him is a continuous battle until victory. EAR-AER honorary member and former EESC president Henri Malosse gave then a remarkable plea for decentralisation. He started from medieval history, during which period local communities were the main actors. Centralisation came with the kings, ruling as a representative of God and later with industrialisation. In the post-industrial digital age in which we live now, too much centralisation is not accepted any longer. The best results on development increase in Europe took place in recent years in small countries such as Malta, Estonia and Slovenia, where governments rule over small communities and are stimulated and controlled by them. Decisions to spend the national budget are not taken top-down in these countries. Cities and regions should have elected governments and develop a strong civil society in order to keep in touch with the needs and expectations of the citizens. Together they are able to detect what Henri Malosse calls “the golden nuggets”, strongly involved individuals coming from all levels of society,-academic, entrepreneurial, cultural, medical, legal world- able and willing to contribute strongly to the development of their region. He pleads also for lifelong learning and to create possibilities for this on a local level. He insists therefore on the role of the European Academy of the Regions, that as in the first place a role to stimulate regions in its creativity and its continuous search for quality and innovation by producing examples from all over Europe. It is Mr. Malosse’s vision that the EU should step down from its top down approach imposing rules and using taxes for purposes far from the average citizen. He pleads for a political approach that leaves more space to a bottom-up approach, involving cities and regions and the decision making in a structured way. Mrs. Madi Sharma, representative of the EESDC Employers Group, insisted on the fact that entrepreneurs are the backbone of society but do not receive the necessary respect for their contribution to employment and growth. She makes though a distinction between corporate and entrepreneurs indicating that the latter are not selfish. The value corporate social responsibility and tend to create an inclusive working environment, to collaborate aiming the regeneration of communities by creating sustainable growth. Mady Sharma: “We live in the era of “co” –co-creation, co-llaboration, co-working, co-lateral-. The era of the boss-patron and the employees who have to execute is finally gone. No manager is still able to master all the necessary competences. We all have to count on the team, when we develop and assignment or project. But that includes also that the recognition and profit has to be shared.” Finally Mrs. Sharma pointed out at the multiple presence of women entrepreneurs in the sustainable growth ecosystem and o numerous amount of jobs they created in that context. Prof. Luigi A. Dell’Aquila, EAR-AER board member and head of a consulting and training center in Rome, pleaded for the maintenance of cohesion and other structural funds of the EU in order to assist regions and cities to continue to develop and to catch up with the rest of Europe. Capacity building for him remains important especially when it comes to innovation, environmental transition and the reinforcement of the fragile territories inside the EU. He invites the EU therefore to include thematic sessions in that sense in their search for common goals for the budget after 2020. Prof. Louis Delcart, EAR-AER board member and guest lecturer and internship tutor at Brussels Diplomatic Academy of the VUB University, made then suggestions to cities and regions to support a future-driven development for start-ups and SMEs. He indicated that the digital natives look at other and broader perspectives that the present leaders and teachers. The new perspectives including digital economy and green economy offer a pallet of possibilities for development, requiring less important investments and a start on a worldwide scene with everybody at the same line of departure. It requires imagination, innovation and an open mind. The trend is not anymore that only the big players have the future, because they master the big data. The trend is also a trend of local initiative, because bringing more authenticity, more reliability and less pollution through transport. The role of the local authorities in this perspective is to create a favourable context, mastering the real estate tycoons, stimulating the development of purpose oriented training and of the stimulation of as well universities, business organisations and dynamic non profit organisations to collaborate on a local or regional level. In the afternoon the speakers scene was foe a large majority composed by women speakers. Mrs. Rezarta Agalliu, president of the organisation Legambiente Vlorë, Albania, started with a nice and applicable presentation of the realisations in a touristic context of her organisation for the benefit of the South region in Albania. Her fellow countrywomen, Mrs. Luiza Hoxhaj, representative of EAR-AER in Albania and executive director at the Albanian Centre for European Policy Studies on regional and local development insisted the possibilities given by the European context to collaboration between social society organisations of different countries, members and future members of the EU. In this regard she insisted upon the existence of the Western Balkan countries and their willingness to improve their social and economic situation in order to prepare themselves for EU membership. She saw a role for the EAR-AER Academy in this process as a stimulator and an inspirator. 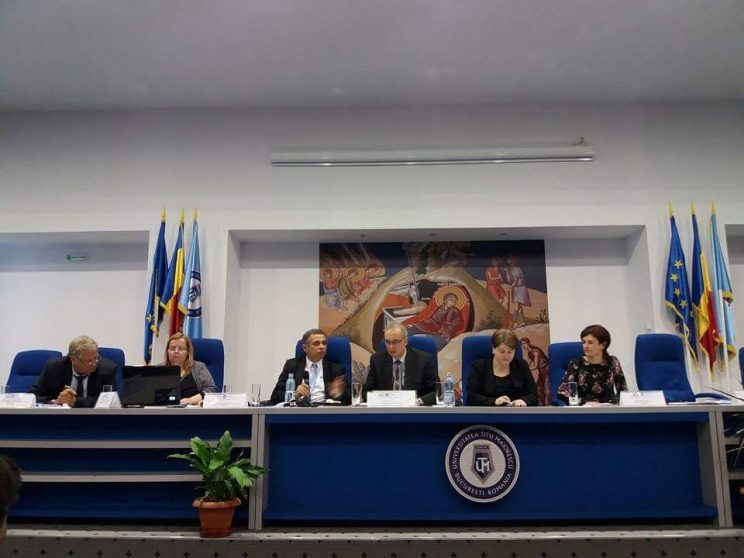 Mrs. Elena Daniela Năstase vice-president of the Centre for Democracy and Sustainable Development Association (CESUD) came then back to the importance of a new human resources approach as well in companies as in organisations, with an emphasis on a human to human approach. This 21st century approach is the cornerstone towards a more sustainable development insisting on a common progress for all citizens and a protective progress for the planet. Dr. Reinhard Eichweber, member of the EAR-AER health care department, insisted then on a process for setting up guidelines in the various medical processes addressing to all actors concerned in the treatment of a pathology. This way of standardisation in a treatment makes treatments more transparent and reduces the hospitalisation period and also the insurance cost and thus the medical cost burden a society contributes to. Professor Blerina Brami, researcher at the “Giorgio Lago” Regional Studies Centre of the University of Padova, Italy addressed then the role universities have to play in the European social and economic context in the 21st century. She insisted on an active role, emphasising on applied research improving and renovating constantly the competitiveness of our European economy enabling it to maintain the specific standard of living and way of life all Europeans foster. She emphasised on technology transfer possibilities put also on entrepreneurial universities, creating the necessary start-ups inspired by their technology and creating in this way also employment. In this way universities find their way to the real world. She pleaded for a triple helix approach, regrouping regional and local authorities in a dialogue with the local and regional employers and entrepreneurs and with the regional universities and technical colleges in order to address the specific social, cultural, economic and medical needs of a region or a city and to find specific solutions in this challenging world. 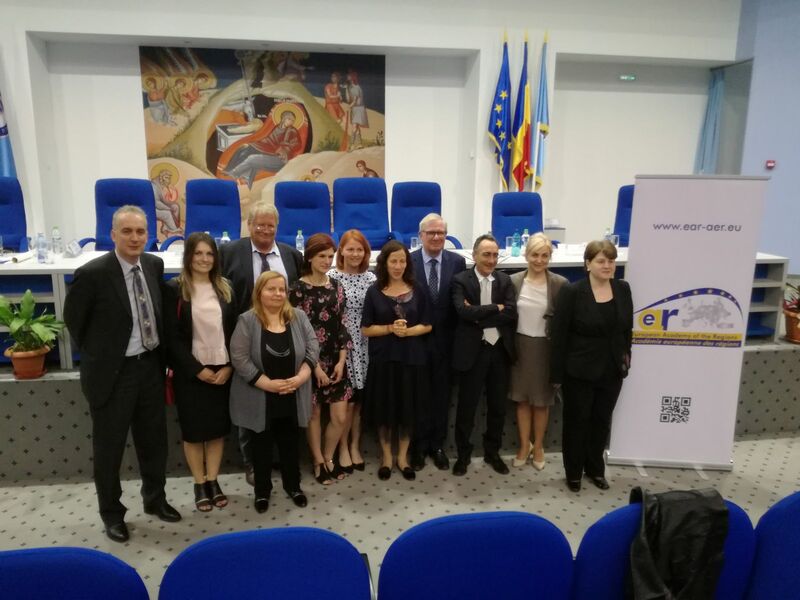 Mrs. Daniela Pohrib, president of Support Association Brasov and Brasov EAR-AER representative was then invited to present her new project for entrepreneurship training to young children in Braşov-Romania, outside the school context. In a final intervention, Mrs. Roxana Minzatu, Deputy, Chamber of Deputies, Parliament of Romania, former state secretary, insisted upon the changes that take place in Romania, where since several years the aim is to regroup the 40 provinces into 8 regions, but where the government wants to relaunch this project. She invited EAR-AER to play its role of inspirator and stimulator in this process. Almost every speaker insisted upon the importance of sustainable development. We do not live in the 20 century anymore during which growth and profit were the only common denominators used by all economy experts. The 21st century tends to work on a number of goals, going from the limitation of social and economic exclusion until the protection of the planet against climate change. The demand becomes stronger to integrate these parameters in political party programs and to elaborate them. Most speakers promoted the collaboration between territories, be it cities, provinces or regions, also cross border, in order to acquire knowhow, but also in order to exchange ideas and to work together on a common better world. It is clear, there has to be a willingness from the interested parties to extrapolate new ideas to its own social and economic reality, without being discouraged from the beginning. Several speakers, and not only those coming from the academic world, emphasised on the need to reorganise the educational system and to adapt it to the 21st century conditions and the 21st century needs. The conditions are explicitly digital and therefore worldwide available, including a permanent stream of information. The needs are of lifelong learning and of appropriate education in order to adapt to the quickly changing social and economic environment. Politicians and business representatives, but also the president of the university, pleaded for a more active role of universities and technical colleges in society and especially in contributing to find solutions for social and economic problems on a regional scale. The triple or quadruple helix approach in a regional context provides a framework enabling the most active partners in society to collaborate and to contribute to the wellbeing of the surrounding community. And not necessarily on a voluntary basis: entrepreneurial universities contribute to create sustainable employment by applying research findings in start-ups and to innovate constantly. Successful start-ups contribute financially to the increase of quality and performance of the university. The bottom-up approach, starting from the dynamic elements in society on a local or regional basis is a next subject that attracted the audience. The creation of an ecosystem of shareholders as well for business as for social purposes is an approach that should be fostered and promoted by local and regional authorities. When highlighting on sustainable development, it is important to stay creative permanently and to create new products and new businesses that tackle present and future needs with new approaches. This last statement leads therefore to one of the most striking visions on the conference. We live in the era of “co”-co-creation, co-llaboration, co-working, co-lateral-. The era of the boss-patron and the employees who have to execute is finally gone. No manager is still able to master all the necessary competences. We all have to count on the team, when we develop and assignment or project. But that includes also that the recognition and profit has to be shared. Out of these conclusions came the appeal for maintaining the European structural funds and cohesion funds after 2020, but with much more responsibility given to the local and regional level and with a clear focus on social and economic development without insisting on so many collateral and additional goals in order to satisfy the needs of all ideologies. A clearly opposite trend was given by the medical speaker. His pleading for a regional approach is related to an approach trespassing the borders of cities and provinces and even nations, and to work in a geographical coherent but larger environment. Indeed when one wants to develop a more efficient methodology on medical treatment reducing the cost of hospitalisation by applying more transparent techniques, this has to be developed on a supranational level, because of the development cost. Basic medicine, treating births, broken bones and mil diseases has to be organised on a local and regional level. Complex techniques for complex pathologies are to be developed on a supranational level in strong collaboration between knowledge centers, but with the goal to make them accessible to as many patients as possible. Finally, we were confronted with so many nice examples of successful projects on a local and regional level, set up by private individuals, by schools, by local civil societies as well as by local authorities in Romania, Albania, Italy, the UK, France, the Low countries, Scandinavia. And we explicitly want to thank them for their courage and resilience.